Is Any Industry Safe From disruption? I recently dipped my toe into the Metals and Mining waters and walked away with the reinforcement that every industry is susceptible to disruption. There has long been a feeling that non-digital industries are safe from the power of disruption. In a recent piece on a New Economic Paradigm, this topic is explored in greater depth, questioning the long term viability of not just current industry structures – but the economic paradigm itself. Disruptive scenario analysis should be a critical focus for every business across every industry. 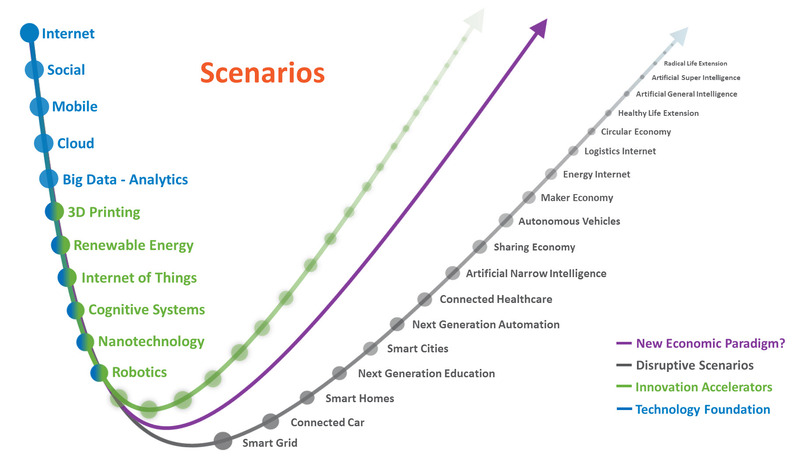 In addition, as these scenarios converge, the implications of this convergence to a given industry or industries must be understood. The anchor visual below identifies a number of scenarios to consider. Let’s take a look at disruption in the context of the Metals and Mining industry, as well as some possible industry responses.